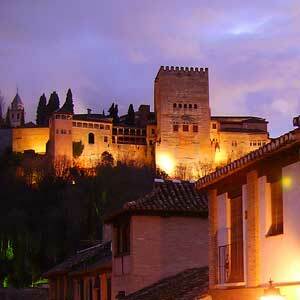 - Visit the Alhambra at night is an experience that should be enjoyed. - Tickets and accompaniment by an official guide are included in the tour. - Do not miss spaces as the Courtyard of the Lions under the amazing starry sky of Granada. Visit the Alhambra at night and immerse yourself in the magic of the Arab legends at the entrance of the Nasrid Palaces. Book our night Alhambra tour, and come under the night sky, where you could see the moon and the stars in the distance through the windows of the Palace of Mexuar. In the courtyard of the Golden Room, the stars create a magical atmosphere that can only be appreciated at night. Enjoy the soothing sound of water flowing from the fountains as it passes through the Comares Palace, the Court of the Arrayanes and the impressive and famous Courtyard of the Lions, the Room of the Two Sisters and the Lindaraja Lookout, a place where the water sound flood your senses. Also, do not worry about how to get Alhambra tickets, we take care of everything and are included in the tour. Meeting Point and Time: pick up at your hotel, located in Granada city center, between 8.30pm and 9.00pm If you are not staying in Granada, the meeting will be in the Parking No. 1 of the monument (P1) between 8:45pm and 9:00pm. In case you are not lodged in a hotel in Granada he pick-up point will be at the Granavision Welcome Visitor Centre, next to the Alhambra (just 100 meters from the Car Park N1), between 8:45 and 9:00pm. Although the tour will start from 9:00pm, our Reception Centre is open from 8:30am, so we recommend you go early, so you can find out information about tourism offers in the city, enjoy our reading spot and free Wi-Fi area or have breakfast in the cafe while the children have fun in the playground. Our greatest wish is that your day in Granada starts in the best way possible. End of tour:The tour ends at the same point of meeting. (1) Tickets for Nasrid Palaces at night: The tour includes the visit to the Nasrid Palaces, the most important of the monument. (2) Official tourist guide: An official guide will explain you the best kept secrets of the monument. (3) Pick up and drop off from your hotel: You can enjoy a short sightseeing tour of the city of Granada going up to the complex. 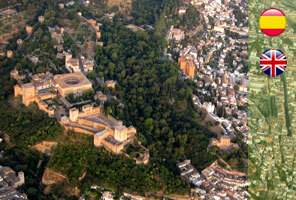 -	The nighttime tour only includes access to the Nasrid Palaces. -	Languages: ENGLISH and SPANISH. -	We recommend to wear comfortable shoes. -	Occasionally, the tour can be do simultaneously in two languages. -	Please confirm the hotel pick-up with a minimum of 24 hours before the start of the excursion, calling at the phone: (+34) 682 086 011 or (+34) 958 535 872. You can pay with your credit card (VISA - MasterCard) or by bank transfer. Your booking will be automatically confirmed after the payment. You will receive the confirmation and voucher in your email. Please, print this voucher and show it to your guide at the beginning of the visit.